A report released April 14 by the Centers for Disease Control and Prevention (CDC) in collaboration with the Food and Drug Administration (FDA) and U.S. Department of Agriculture (USDA) showed important declines in foodborne infections due to common bacterial pathogens in 2004. For the first time, cases of E. coli O157 infections, one of the most severe foodborne diseases, are below the national Healthy People 2010 health goal. From 1996-2004, the incidence of E. coli O157 infections decreased 42 percent. Campylobacter infections decreased 31 percent, Cryptosporidium dropped 40 percent, and Yersinia decreased 45 percent. Overall, Salmonella infections dropped 8 percent, but only one of the five most common strains declined significantly. Different Salmonella strains are found in a variety of animal hosts and in different geographic locations. Further efforts are needed to better understand why some Salmonella strains tend to contaminate produce during production and harvest. FDA has recently developed a plan to decrease foodborne illnesses associated with fresh produce. To better control foodborne pathogens in animals and plants, prevention efforts should be implemented across the farm to table continuum. "This report is good news for Americans and underscores the importance of investments in food safety. Our efforts are working and we're making progress in reducing foodborne illnesses," said CDC Director Dr. Julie Gerberding. 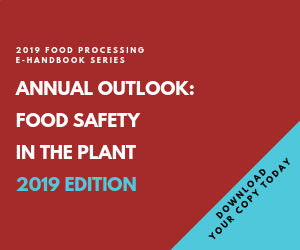 "However, foodborne disease is still a significant cause of illness in the United States and further efforts are needed to sustain and extend these important declines and to improve prevention of foodborne illnesses." "The continued reduction in illnesses from E. coli O157 is a tremendous success story and we are committed to continuing this positive trend in the future," said USDA Secretary Mike Johanns. "These results demonstrate that through innovative policies and strong and consistent enforcement of inspection laws, we are protecting the public's health through a safer food supply." Several factors have contributed to the decline in foodborne illnesses. USDA's Food Safety and Inspection Service implemented a series of new recommendations beginning in 2002 to combat E. coli O157 in ground beef and Listeria in ready-to-eat products. In response, most establishments have significantly enhanced their food safety systems. Many have applied new technologies to reduce or eliminate pathogens and have increased their testing to ensure the effectiveness of control measures. Furthermore, these improvements likely reflect industry efforts to reduce E. coli O157 in live cattle and during slaughter. The reduction in Campylobacter infections may be due to greater consumer awareness of safe poultry handling and cooking methods. Food safety education efforts targeted to specific foodborne hazards as well as general consumer tips, such as the public-private Fight Bac campaign, have helped consumers become more aware and knowledgeable of food safety hazards and how to prevent them. The incidence of Shigella, which is found in a wide variety of foods, did not change significantly from 1996 through 2004. Vibrio infections increased 47 percent. Vibrio infections, which are primarily associated with consumption of certain types of raw shellfish, can be prevented by thoroughly cooking seafood, especially oysters. In 1996, the FoodNet surveillance system began collecting valuable information to quantify, monitor, and track the incidence of laboratory confirmed cases of foodborne illnesses caused by Campylobacter, Cryptosporidium, Cyclospora, E. coli O157, Listeria, Shigella, Yersinia and Vibrio. Since its inception, FoodNet has grown to include ten states and 44 million people, about 15 percent of the American population.